For this conversation I am referring to a “reload” as a magazine swap…empty one in your gun swapped for full one from your mag pouch. While some folks can talk about four kinds of reloads, I have narrowed it down to just two. There are two basic “reloads” in combat; 1) tactical, 2) speed. A tactical reload is slower and generally used where you have cover and time. A speed reload is very fast in a firefight where you have to put rounds down range quickly. So the situation you are in dictates which reload you do…fast or faster. Tactical reloads give you the opportunity to swap a magazine while cover protects you and you have a little more time to get he swap done. This would normally occur when you have others around you to keep rounds going down range. The standard “reloading” yell should be used to make sure that someone is still throwing lead while one or more people reload. Tactical reloading can occur when you are completely empty or partially empty. The idea is to get a full magazine in your weapon and return to the fight. Speed reloads give you the opportunity to get ammo back in the gun and rounds headed down range as absolutely quickly a possible. 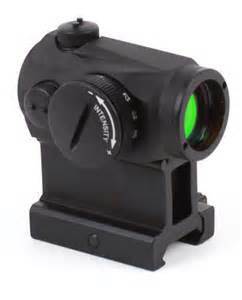 Additionally, the shooter’s eyes never leave the target. Hence, you don’t lose track of the enemy who is trying to kill you. And the mag swap is done completely by muscle memory and feel. 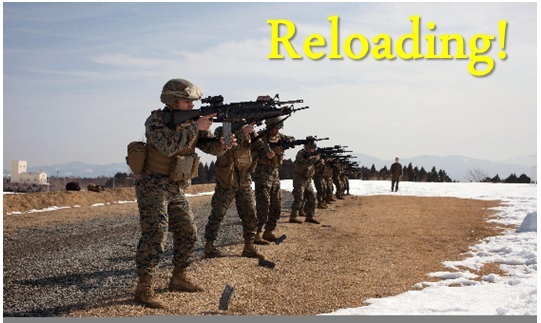 If your unit has trained to do so, you implement the standard “reloading” yell to make sure that someone is still throwing lead while you reload. This reload is commonly done only you’re your weapon is empty. Since you have no cover to protect you…your rounds heading down range become your cover. 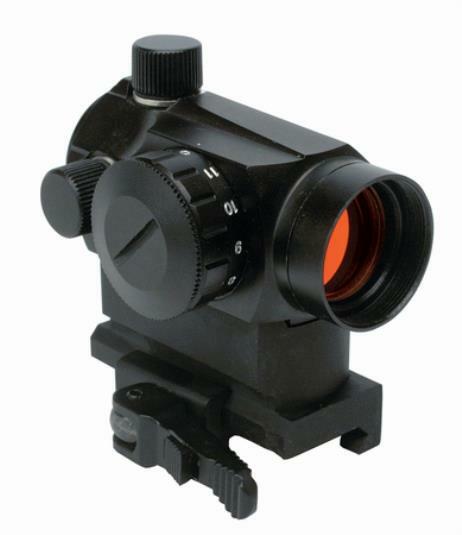 The goal should be…Get your cover headed back down range as fast as possible! Speed reload can get you shooting again in under 3 seconds! I normally, almost always, wear tactical gloves while shooting. Also, I use only double magazine pouches (see note below). They have the stretch/snugging material on them to keep a single mag from moving around or dropping out. I use covered mag pouches due to the dirt and sand where I live. I primarily use only Pmags. I only load each mag with 28-rounds (see note below). I place them into my mag pouch with the front mag slightly taller than the rear mag. The lip on the bottom of the Pmag is the guide for keeping the front mag taller. I am right-handed so I reload with my left hand manipulating magazines. Since I wanted to use a consistent system I use my mags from left to right on my vest. I also use the front mag first. When my mag is empty I either drop it to the ground (for speed reloading) or I place the mag in my drop pouch (for tactical reloading). I’ve been known to occasionally shove an empty in my back pocket or the lower left knee level cargo pocket on my pants. Speed and convenience requirements determines if I break my routine. I try not to break my routine. Now for the question of “drop pouch” usage. There is a case for both using a drop pouch and not. 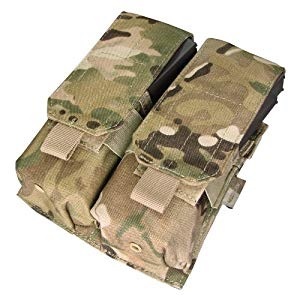 The US military uses drop pouches. Not that they can’t afford to buy more magazines, it’s just a good idea for individual soldiers to maintain their own supply of magazines without depending on resupply. This is especially true while engaging the enemy and a resupply would put others at unwarranted risk. 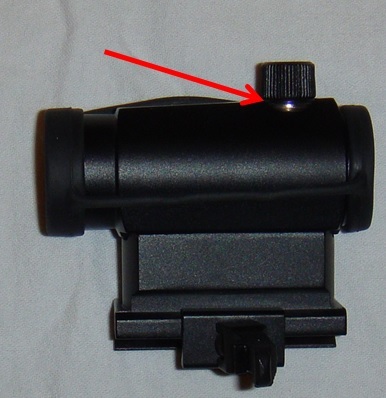 The case against using a drop pouch is fairly simple…no time to put your mag in the pouch. This means you have to get more rounds on target faster. Taking the time to place a mag in the drop pouch would eat up a second or two…that’s 3 – 10 rounds not heading at the enemy. This means that using a drop pouch during a speed reload shouldn’t happen…it just takes too much time. As a prepper after the SHTF you really want to maintain your supply of magazines if at all possible! Otherwise…where are you going to go buy replacements. Now, there is a line of thought against using a drop pouch at all. 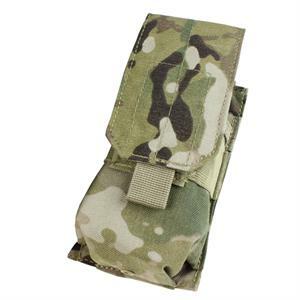 It calls for you to put your empty magazine back into the mag pouch that it came out of. I think that is a sure way to die, or at least give the enemy an upper hand, when it is totally uncalled for. Think about it…if your life is on the line, you have no cover (other than your own rounds), do you really want to take the time to put a mag back into your vest pouch? Notice I haven’t even touched on whether it is even possible to do or not. Let’s think this through…You have three double magazine pouches on the front of your vest and you have one mag in the gun. Time for a reload! You pull the new mag out of your vest pouch, you grab the empty pouch that is in the gun with the same hand you are holding the new mag, you press the mag release, you remove the mag from the gun, and manipulate the new mag into the gun, place the empty mag in the mag pouch, hit your bolt release, and continue the fight. Does that sound like something you want to do? 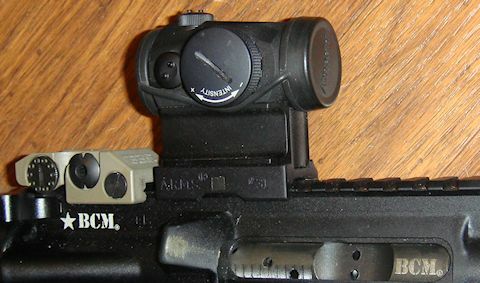 While your left hand is retrieving your new mag, (your right hand index finger is already indexed and the mag release is at your finger tip) you push the mag release button with your right index finger while giving the gun a counter-clockwise flick, you place the new mag in the gun, hit your bolt release, and continue the fight. It is all one seamless motion. That’s right…you got the empty mag out of the gun while you were retrieving the full mag. You also have full control of your full mag since it is the only mag in your hand. And you are not fumbling around trying to put an empty mag back into your vest pouch. So now here is a monkey wrench in that whole thing…I don’t know many folks who don’t wear tactical gloves. Using the “return empty mag to mag pouch” method with the empty mag in your hand, can you find the empty mag pouch with your glove covered fingers? What if you can’t? Do you have to look down to see where the empty mag pouch is? Now…as you looked down you just lost track of the guy(s) that were shooting at you. OK, try this…Using the “return empty mag to mag pouch” method you are prone, you pull out the new mag, and now you are trying to put an empty mag back into a pouch while lying on the pouch. How’s that going to work for you? 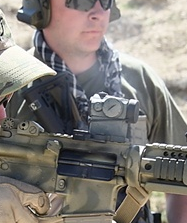 And here is the worst scenario using the “return empty mag to mag pouch” method …You are doing a reload and you reach to your mag pouches on your vest, you grab a mag that you are going to place into your gun…and the mag is empty!!! That is the fatal flaw with that methodology…knowing for sure which mag has ammo in it and which do not. Don’t fall into those traps. Only use systems/processes that make sense and actually work in the field under extreme stress. Now, in all fairness the guy that I watch demonstrate this particular reload methodology (all empty/full mags in mag pouches on the vest) sells a product that keeps a mag pouch mouth open. I’ve never used the device he is selling so I can’t comment on how effective it is. But, I can tell you that only using single mag pouches is NOT a good idea in my opinion. And even with his product that he is selling…this methodology is still a very poor idea…at best. So please, stick with what has proven over and over again to work…use double mag pouches, use a drop pouch to place your discarded mags in, unless you are doing a speed reload. Stick with what the gunfighters do…anything else is a recipe for disaster! So now…what about those partially empty mags in your drop pouch? Dah…get them back into the action! Move your full mags to the left most mag pouches. 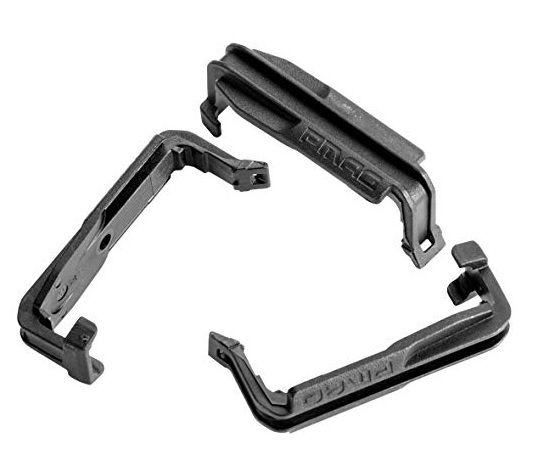 Retrieve your partially full mags from the drop pouch one at a time pulling the heaviest out first. Place the mag in the left most empty pouch. Repeat until all the mags in your drop pouch that have ammo in them are now in your mag pouches on your vest. Retrieve a partially full mag from your drop pouch. Make sure it is usable. Retrieve another partially full mag from your drop pouch. Whichever has the least amount of ammo in it, remove the rounds and place those rounds into the mag with the most rounds in it (the other one that you retrieved from the drop pouch). Continue to do so until you have topped off a mag (28-rounds, see note below). 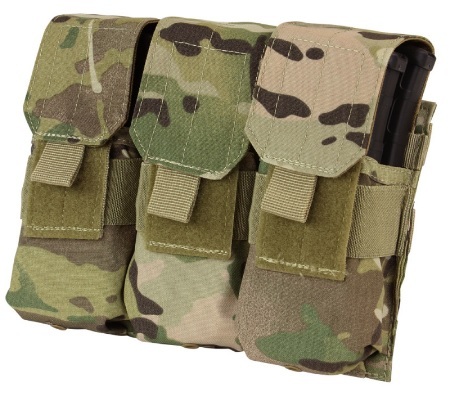 Place the topped-off magazine in the left most empty mag pouch on your vest. Repeat until all mags in your drop pouch no longer have rounds in them. If you have a fixed fighting position that presents itself as being suitable…Does it make sense to have a cache of full magazines there? Think about it for a second…Would it be nice to have more magazines available during a firefight…without having to stop and reload those magazines while rounds are coming at you? In my opinion…If you are in a suitable fixed fighting position (foxhole, guard house, etc.) there should be a cache of loaded ammo magazines there. They should in a safe, readily available location, in a container that keeps the mags and ammo clean and dry. In a firefight you should try to use those mags first before you start taking them out of your vest pouches. 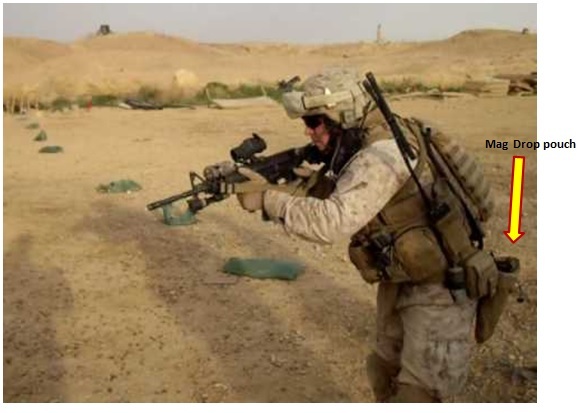 Example #1: You are in a fixed fighting position in a firefight. You have been using your mags from your vest pouches. You are forced out of your fixed fighting position. How much ammo do you have left on your person? Answer: Who knows…maybe some, maybe none. Example #2: You are in a fixed fighting position in a firefight. You have been using the mags from the cache in your fixed fighting position. You are forced out of your fixed fighting position. How much ammo do you have left? Answer: Your full battle load, on your vest. You may or may not want to drop magazines while in a fixed fighting position. Remember, it is about the presence of cover and how much time you have to get back into the fight and start shooting. 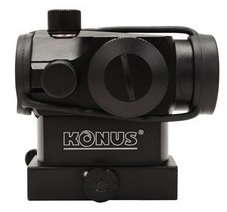 If you need to get rounds down range…drop the mag and get shooting. If you have cover and time…drop the empty mags into a protected, easy to use container. Take enough ammo into the fight. Running out of ammo is a real downer when the other guy is still shooting at you. Be fast in reloading your weapon. Speed matters, micro-seconds count. Train, train, train…your muscles will learn what to do with enough training. When the stress goes through the roof and it is hard to think…your mind/muscles will remember what they need to do if you have trained enough. That frees your mind up to pay attention to your SA…and good SA helps keep you alive. I am very serious…practice both the tactical and speed reloading methods. Of course you would do it with dry (unloaded) mags unless you are in a safe location. 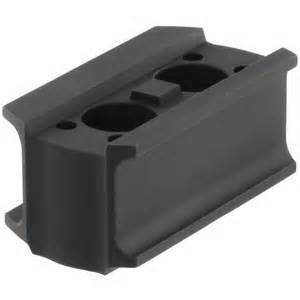 Practice reloading your magazines from your drop pouch. Let your fingers learn what it feels like. Find flaws in what you are doing while you are training…not while you are fighting for your life. Your mind is a powerful tool that runs your weapon systems. But your mind will only do what it has been trained to do. Train your mind! Let me know if you have great ideas you want to share! Warning! : Don’t let someone sucker you into thinking incorrectly about when to speed reload or not. 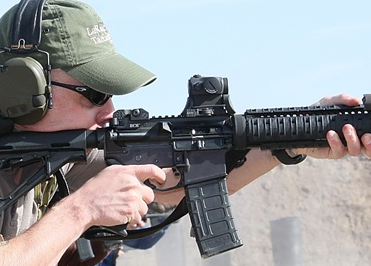 Speed reloading is done when you have to get back into shooting as quickly as possible. That is when you drop your mag to the ground and not waste time putting it into a pouch of any kind. You might be out in the open or you might be in a fixed fighting position…it doesn’t matter where you are! What is important…and the only important thing…is the presence of cover and the amount of time you have to get back into the fight. Note #1: I only load my mags to 28 rounds. Why? I don’t want to stress the lips for one. But…WAY more importantly I learned a lesson the hard way during a very stressful training session. I had a mag with 30 rounds in it. I tried to place it into my weapon with the bolt carrier group closed. It wouldn’t seat correctly. It would fall out. I just couldn’t get the top round in the magazine to depress enough to allow the mag to seat correctly. Bummer! Never again, I go with 28 rounds giving magazine plenty of room to depress and seat…and it is easier on the lips as well. Yes, I finally flipped the top round out of the full mag with my thumb and the mag seated and I was back at it. Note#2: For long term storage of my Pmags that have ammo in them I use the Pmag Impact/Dust Cover Gen M2 MOE. It keeps the top round off the lips relieving the stress. It also keeps dirt, sand, and junk out of the mag. When needed I remove the cover from the mags before going operational. But, should you forget and go into action with the covers on, not to worry…they flick off easily with your thumb as you take them out of the mag pouch. I tend to go with the individual single pouches, three on my vest. 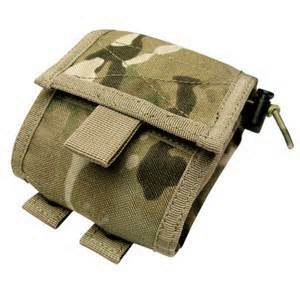 I think using individual pouches gives your vest a little more flexibility than a double or triple pouch set-up. But that is only my preference. 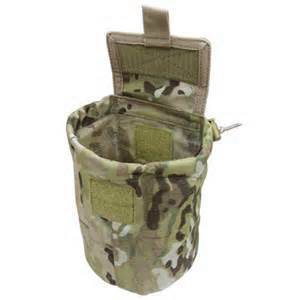 Note #4: The magazine drop pouch that I prefer is the Condor roll-up mag drop pouch (MA36-008 : Roll – Up Utility Pouch – MultiCam). Note #5: In any fixed fighting position you have control of make sure that you maintain a cache of loaded magazines. The mags should be fully functional and loaded with quality ammo. The mags should be stored in such a way that they stay dry and clean and readily accessible. Periodically swap them out with other mags. That way they will allow the springs to relax and you can inspect them for damage…good idea to clean them periodically as well. 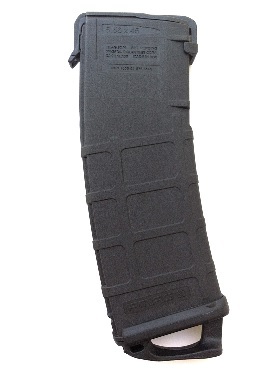 I would also seriously consider using the Pmag Impact/Dust Cover Gen M2 MOE for cache mags. 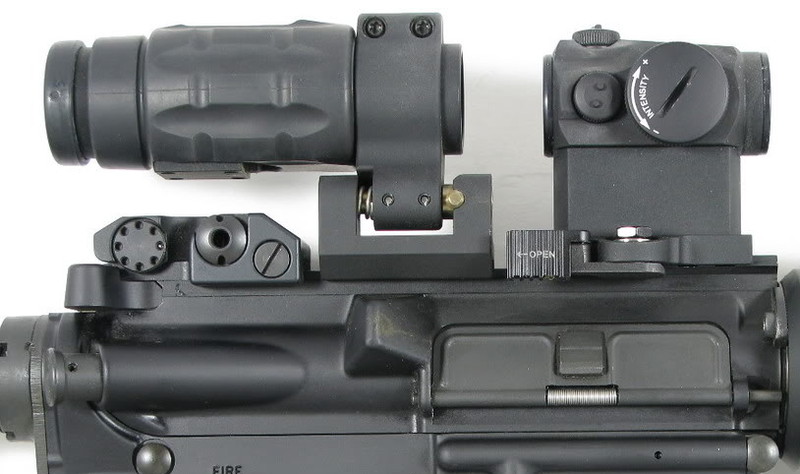 Note #6: Should the last two or three rounds in a mag are tracers? Well, I have no opinion of if that is a good idea or not. There is a case to be made either way. 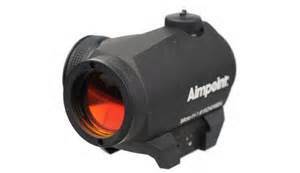 If you are in a gunfight and you see tracers headed down range that is a clue to reload vs. waiting for the bolt to lock open. 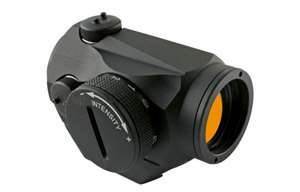 On the other hand…if the bad guy doesn’t know exactly where you are and they see your tracers…well, they now probably know exactly where you are. So it is a personal preference thing. I personally don’t use them that way.